If it’s as odd for you to consider the prospect of an Action Comics without the Last Son of Krypon as it is for me, this Annual edition should throw you for a bit of a loop. Granted, the series wasn’t always so intently focused on Superman, and given the retro movement that seems to be sweeping through the industry, perhaps a change of focus isn’t completely out of left field. While Annuals have never been particularly renowned for their continuation of the monthly’s ongoing storylines anyway, this year’s installment takes that concept a step further. Rather than a single, double-sized story, Action Annual #13 has opted to go the anthology route, with two feature-length stories and an extra-brief backup tale featuring a few of DC’s non-leading men. In “Father Box,” Paul Cornell and Marco Rudy explore an undocumented meeting between an ancient intergalactic menace, Darkseid, and Metropolis’s own locally budding mad genius, a young Lex Luthor. It’s an unusual tale, one that moves in leaps and bounds, jerking readers away from their expectations just as soon as they’ve been developed. One moment we’re enjoying a charismatic baby-faced Lex, clawing his way up from the streets in a cash-strapped, crime-soaked younger Metropolis, the next a glowing pink door materializes in his office and we’re jolted off, literally, to another dimension. It’s an enjoyable little romp, matching laid-back, adventurous storytelling with free form, unusually composed visuals, though I couldn’t help but notice the unanswered questions that kept tugging at the back of my mind. 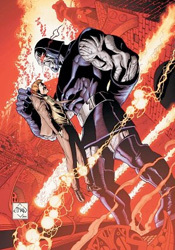 Why does Darkseid come off less like a power-hungry evil tyrant and more like the Mad Hatter? What era are we in, when Luthor and Perry White are still bright eyed and bushy tailed, but civilians stroll around with smart phones in their hands? It’s a bouncy, energetic action / adventure playground, but not one that grants more than a fleeting glance to the structures of continuity. For better or for worse. Cornell again spotlights young Luthor in the issue’s second tale, “A Father’s Box,” this time with artist Ed Benes at his side and Ra’s al Ghul teaching Lex a few lessons. Told almost exclusively in prose, this anecdote works as a deliberate, casually paced counterpart to the first. Here, the writer’s take on the well-examined central figures is more honest and recognizable. It’s not the joyride that Lex’s encounter with Darkseid was, and as such it pales in direct, immediate comparison. On the whole, though, it’s a more complete, enjoyable story. Though neither tale (nor the five-page Batman Beyond backup yarn) seek to further any current narratives, they do provide a certain degree of added depth to each character enjoying the spotlight. Naturally, there’s that lingering question of where these adventures belong in the grand scheme of things, if at all, brought on by the strange disconnects and missteps I’ve mentioned above. But, assuming they are legitimately in-continuity, both stories add a certain degree of depth and lore to three of the publisher’s most highly regarded demons. This isn’t required reading, but it’s worthy of a borrow.